Programs, Community Events and More! the great outdoors, enjoy an active life and join with neighbors. Our staff is currently preparing for the statewide Texas Recreation and Parks Society Expo and Institute, which will bring more than 1,400 industry professionals to Waco on Feb. 26 - March 2. Our department is the host for this year's event and has managed the planning of the conference, which will include educational sessions, ceremonies, tours and more. Another main component of the event is the Texas State Maintenance Rodeo competition. Our parks crews are organized this year's event at Riverbend Park. The initial phase of design work for the upcoming renovation of the Suspension Bridge is taking place this month. Public access may be limited to certain areas Monday-Thursday of each week. Waco’s historic Suspension Bridge, which opened in 1869, is set to undergo a $5.8 million rehabilitation effort in 2019 to address structural needs. The project will help preserve Waco’s most notable public landmark and ensure its continued use for many generations into the future. The project is expected to be bid out in the fall with work starting in early 2019. Construction is underway for the new Doris Miller Memorial, which will be in the Bledsoe-Miller Park area along the Brazos River. On this past Pearl Harbor Day, a 9-foot-tall bronze statue depicting the Waco-born World War II hero was unveiled with local dignitaries, Miller family relatives and former crew members of the now-decommissioned USS Doris Miller. The statue is a centerpiece of the memorial. Officials have raised $1.2 million for the first phase of the memorial and are hoping the installation of the statue will help them raise an additional $600,000 to complete it with a stylized ship hull that will envelop the war hero. Parks crews have been hard at work this winter with two major projects near the downtown area. Crews have been removing and replacing aging trees along Austin Avenue, along with clearing and cleaning a long stretch of creek at Dewey Park. Areas around the creek will be utilized for a new 9-hole disc golf course that is being installed in the parkland next to Dewey Community Center. Crews have been partnering with local organizations like Habitat for Humanity and Keep Waco Beautiful during the past months for projects like Christmas Tree Recycling and MLK Service Day along the Brazos. The winter season is underway and we have had a great response to leagues like adult soccer, football and basketball. 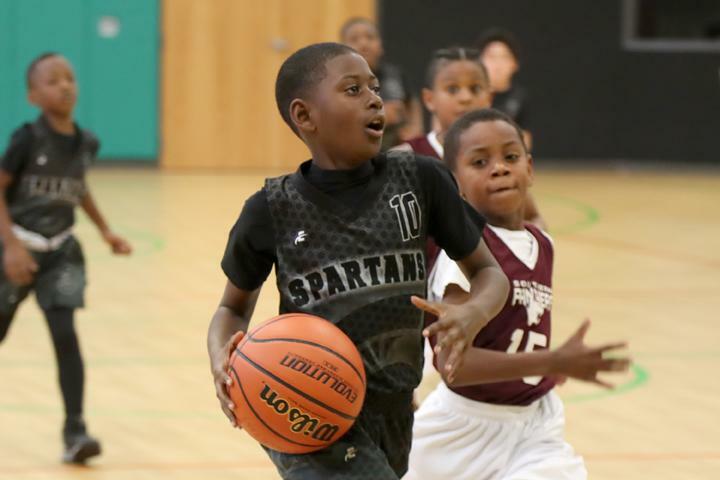 Youth basketball leagues are always one of our most popular offerings, and this season we have 42 teams playing at all of our community centers each weekend. Registration is underway for spring leagues for co-ed volleyball and adult soccer. In March, staff will host two state basketball tournaments (Church and Men's 6 Feet-and-Under) for the Texas Amateur Athletic Federation. Our event staff worked with multiple organizations to host Waco's weekend of events in honor on Martin Luther King, Jr. Events included a wreath-laying ceremony, a march across the Suspension Bridge and a candlelight vigil. The annual Miracle Match Marathon took place at the end of January attracting nearly 2,000 participants for a marathon, half-marathon, a 5k and a kids run. Dates have been set for the department's annual Brazos Nights concert series (April 20, May 4, June 9), Pints in the Park (May 19) and Fourth on the Brazos (July 4). We are excited to announce the we are currently accepting applications for the the 2018-2019 Youth Council. This is a great way for local high school students to impact and learn about our community and city! For information, call 254-750-8071. The Bledsoe-Miller Community Center is looking for local churches, praise dance teams and gospel groups to join the annual GOSPEL EXPLOSION on Feb. 15! This annual event is in honor of Black History Month and is free to the public. The event is scheduled for 7 p.m. to 9 p.m. at the center. For more information call 750-8684. Come see what the new Camp Fit program at Bledsoe-Miller Community Center is all about. The morning fitness class takes place every Monday, Wednesday and Friday from 7 a.m. to 7:45 a.m. Classes are $3 per person and open to everyone. Locker rooms and showers are available as well! For more info, call the center at 254-750-8684. Dewey Community Center is currently hosting Zumba classes on Monday and Wednesdays from 6 p.m. to 8 p.m. They are also hosting a Beginner Computer Skills class during February and March. The annual Public Safety Fair is set for March 7 at Dewey Community Center. This event gives kids the chance to interact and learn about local law enforcement agencies. Our community centers (Bledsoe-Miller, Dewey and South Waco) are accepting registration for Spring Break Camps, which will take place on March 5 - 9. For information call: Bledsoe (750-8684), Dewey (750-8677) and South Waco (750-8650). Calling all Junior Rangers! Come on out for our monthly junior ranger day this Saturday, Feb 10. And we just received a shipment of Junior Paleontologist badges, available on junior ranger days ONLY! Junior Rangers also receive a program book as well. Junior Ranger Days will be hosted once a month this spring at the park. On Feb. 10 - 14, our staff will host a Valentine's Station where kids can create free Ice Age valentines at our craft station. Color them, personalize them, and give them to someone special! During January 2018, Waco Mammoth National Monument posted $25,340.46 in combined revenue and attracted 4,300 visitors. The annual Mammoths on the March event has been set for the afternoon of Saturday, March 24! Staff at Cottonwood Creek is gearing up for the spring tournament season and reports that the calendar is near capacity. Did you know that Cottonwood Creek is home to 14 local high school golf teams. The players practice at the course on weekday afternoons. Park Rangers are starting the second semester of “Park Patrons,” an after school program with Indian Spring Middle School Service Learning students. The students meet with Rangers to participate in activities designed to teach them an appreciation of the outdoors and to be good land stewards in their local community. Students learned all about the Park Rangers and the Parks and Recreation Department at LaVega Elementary's Career Day. Rangers visited with a mathematics class at the Greater Waco Advanced Manufacturing Academy to talk about the nature and safety of Cameron Park. Students from Kendrick Elementary and Waco Montessori went hiking in the trails with the Park Rangers to learn more about nature and the history of Cameron Park. Park Rangers and other City of Waco employees participated in the City's CPR and First Aid Certification Safety Training Class. The Waco Bike Club and two Eagle Scouts completed a bridge replacement project in the Cameron Park Trails. We welcome aboard our newest Park Ranger, Nestor Leon.